I’ve been waiting on reviewing this restaurant for a while, feeling like it wasn’t quite ready for prime time when it initially opened. Since then, the service—although still somewhat spotty—has improved, as has the food, which leans heavily toward Cantonese. During a recent lunch, a server named Mike was surprised that I was able to identify Ho Mei’s cuisine as Cantonese. But the Peking-style ducks, spiced cuttlefish, barbecued pork and such hanging in the window are dead giveaways. Sure, there are standard Hunan/Sichuan-style dishes on the very extensive menu—kung pao chicken, Mongolian beef and the like—but Cantonese flavors dominate at Ho Mei BBQ, and are much more subtle than most of what passes for “authentic” Chinese fare in these parts. Don’t come looking for pot stickers, cream-cheese-filled wontons or fortune cookies. But then, what is “authentic”? During a chat with Pago and Finca owner Scott Evans the other day, he caused me to stop and think when he said, paraphrasing, “How could food be authentically Spanish unless you’re in Spain and it’s cooked by a Spanish cook with local ingredients?” The same, I suppose, could be said for Italian food, Japanese food, Chinese food or any other. So, let’s not call Ho Mei BBQ “authentic Chinese,” even though all the cooks are from China. Let’s call it “authentic Chinatown cooking,” because that’s what it is: the sparkling flavors you’d find in the best North American Chinatown restaurants. Not surprisingly, some of Ho Mei’s cooks have worked in New York City’s Chinatown, as well as San Francisco’s. There’s an excellent server named Juanita who is Chinese but grew up in NYC’s Chinatown and knew coordinates like Bayard and Mott streets when I threw them at her. Enlist Juanita in helping you dissect the overwhelming Ho Mei menu. She’s terrific. Now for the food. For starters, there are 200-plus menu items, not counting the soups and appetizers. There are 16 variations of porridge alone (try the abalone/pork/seafood combo), and 14 clay-pot offerings, including spare ribs with bitter melon ($8.95). I could eat at Ho Mei three times a week for the next year and still not experience the entire menu. At a restaurant like Ho Mei, you’ll grapple with rubbery things, slippery things, glutinous things—in short, things you’d recoil from in a contemporary American eatery. Do it, remembering that this cuisine is thousands of years old. 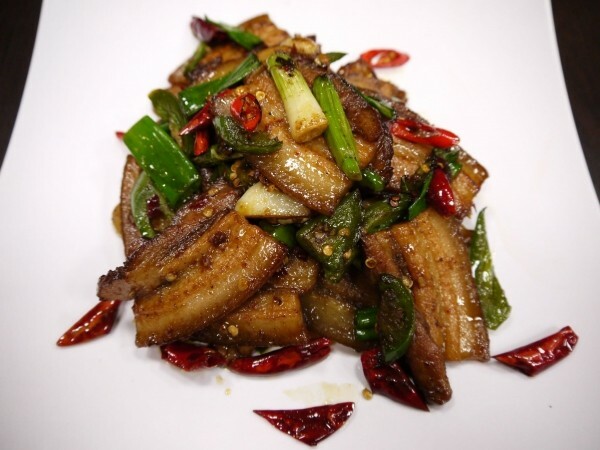 You will not find pork belly with pomegranate “jam”; you will find pig stomach in XO sauce ($13.25), pork belly with black-bean sauce ($9.25), chicken feet Baiyun (soft, but chewy and acidic from rice vinegar, $4.25), beef tripe with pickled veggies ($8.95) and squid stir-fried with Chinese melon ($8.95). Conversely, you could select a dish from what must be ironically labeled the “Chef’s Special” section of the menu: dishes like walnut shrimp or orange beef tenderloin, which I’ve heard no Chinese person has ever ordered. The rice rolls are a must. They are a sort of Chinese cannelloni: soft, steamed, delicate rice-flour sheets, wrapped around fillings like beef, pork, black mushrooms and chicken. I like the shrimp version ($3.85) best. Normally, I avoid fried rice in Chinese restaurants; after all, it’s leftovers. However, Juanita talked us into Fujian fried rice ($9.25), and I’m glad. It begins like any other fried rice: leftover white rice stir-fried with diced chicken, shrimp, carrots and peas. However, it’s served “wet” with a luscious brown gravy that turns it into something special. Mongolian beef for lunch was tender slices of boneless beef in a rich brown sauce with dried red chiles, scallions, onion and, unfortunately, quarter-size slices of fresh ginger, which completely destroyed my palate, so I avoided them. There’s a selection of 32 different lunch specials, all priced at $5.95 and served with fried or steamed rice. The free-range soy-sauce chicken ($7.95/half, $13.95/whole) was stupendous: oh-so-tender, but with a lovely brown-soy-sauce barbecue “bark.” Ma po tofu ($8.25) with silky, housemade bean curd is also excellent. And cumin-spiced beef ($8.95), which I’ve never seen on a Chinese menu before, was equally terrific. You won’t want to order wine, which is Franzia. Instead, take a gander at what to drink with Chinese food in this week’s Drink column, and BYOB or opt for Tsingtao beer; a red-bean or grass-jelly ice; chrysanthemum, ginger or jujube tea; Ovaltine (seriously) or soda. Hey, we’re in Chinatown, not Napa.